These survive well in an aquarium. Worthy of note among the carnivores are the Protoreaster and Oreaster genera, which feed on other invertebrates, especially the bivalve mollusks. They must not be kept in a tank with other invertebrates. Feed them with raw or cooked mussels. Other genera, such as the Echinaster, Linckia, and Fromia, are microphages and feed on the assorted debris found on the aquarium bed. 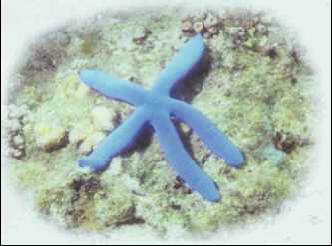 They are preferable to the carnivorous starfish in an aquarium. The ophiuroids are attractive echinoderms in a marine invertebrate tank; they can be accidentally introduced with live rocks. Size: 10-15 cm.